The Humane Party—which is the nation’s first and currently only political party committed to animal rights—began registering voters yesterday in Los Angeles County, California. Forty new registrants, including former Democrats, Republicans, Green Party members, and Libertarians, switched to the Humane Party. Voters registered at the Humane Party’s booth at WorldFest, a vegan and eco-friendly festival in the Los Angeles area. The booth was the political party’s first-ever public appearance of its kind. 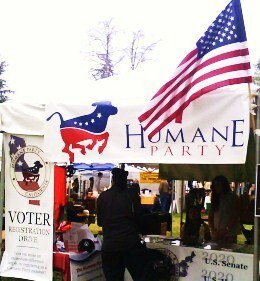 The Humane Party, America’s first animal rights party, hosts a booth at WorldFest , 2011, in Los Angeles County, California.